Here are 10 different recipes to make a honey facial mask for different skin types, including oily skin, dry skin, combination skin, normal skin, sensitive skin, as well as a firming facial mask. 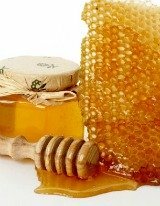 To read about honey and acne, and find a facial mask suitable for this skin condition, see this link. I recommend you do a patch test first to ensure you do not suffer any allergic reactions to the ingredients. Please note, I do not claim that any of these facial masks have proven medical benefit, or that they are approved by any medical authorisation body. In the event that you have a skin condition or are on medication, it would be best if you seek the advice of a doctor. If you are pregnant or breast feeding, seek advice before using any of these facial masks. Perform a patch test on a small area of the skin before applying to the whole of the face. Combine the ingredients in a blender and apply to the face. Leave on the face for 10 – 15 minutes. Combine the ingredients in a blender and apply to the face. Leave on the face for 10 – 15 minutes, then rinse. Puree the spinach in a blender with the oil, then add the rest of the ingredients and combine together. Apply to the face. Leave on the face for 10 – 15 minutes, then rinse off. Combine the ingredients and apply to the face. Leave on the face for 10 – 15 minutes, then rinse off. First put the dried lemon grass herbs in your mixing pot, and add the warm water to create a ‘tea’. Leave for about 5 minutes. Add the rest of the ingredients, and combine. Apply to the face and leave for 15 minutes. Rinse off. Place the ingredients together in a blender, and combine. Apply to the face, and leave for 15 minutes, then rinse off. Whisk the egg white until frothy. Add the honey and glycerine and whisk again. Add the cornflour a little at a time until a paste is formed. Apply to the skin and rinse off after 10 minutes.